The Cayman Islands are made up of three islands (Grand Cayman, Cayman Brac and Little Cayman), all of which are home to a number of birds both endemic and introduced. The Cayman Islands is an oversea territory of the British located on the Caribbean Sea. The island covers an area of 102 square miles and comprises of three islands: Grand Cayman, Cayman Brac, and Little Cayman. The islands are peaks of massive Cayman Ridge. The islands were formed by a large coral head which covered a submerged ice age peak of the Cuban Sierra Maestra range. The avian fauna of the Cayman Islands comprises of two endemic subspecies of the Amazona Parrots which are restricted to the Cayman Brac and Grand Cayman Islands. The avifauna of Cayman Island includes 244 species of which 98 species are accidental while four species are introduced. Least Grebe is an aquatic bird and the smallest member of the grebe family. It is found in a wide variety of wetland habitat including ponds, lakes, and slow-flowing streams. Least Grebe prefer freshwater bodies with significant vegetation cover, especially along the edges. It ranges from 8 to 10 inches in length and weighs between 112 and 180 grams. Its legs are at the back its body making it a challenge for the bird to walk properly. Least Grebe is an excellent swimmer and diver. It feeds on a variety of aquatic life including fish, frogs, and aquatic insects. It pursues its prey underwater. The Least Grebe breeds throughout the year. The Black-capped Petrel is a seabird also known as the diablotin. The bird nests in burrows in remote highland areas of the Cayman Islands. The holes are located on forested cliffs making it difficult to locate. The black-capped petrel is a long-winged petrel with gray to brown back and wing and white underpart. The bird is nocturnal on its breeding ground to avoid predation by hawks. Its walking ability is limited to a short distance to the burrow. Black-capped Petrel occasionally utters croaks while foraging at sea. The bird lays its eggs in January and sometimes hatches in March with the fledging depart the nest in June or July. The White-tailed Tropicbird is the smallest bird among the three related seabirds of the tropical oceans. It breeds on islands and lays its egg on the ground. 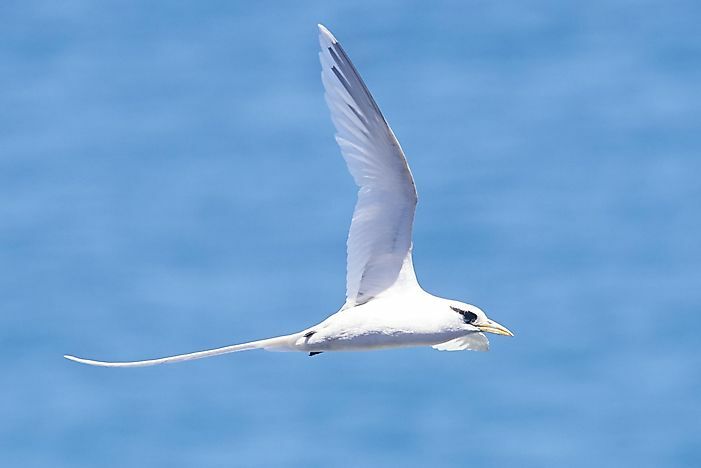 The White-tailed tropicbirds disperse widely over the ocean if they are not breeding and may wander further than their original habitat. An adult bird is slightly slender and has a long central tail feather. Its bill is orange to yellow in color while the inner wing has a black band. The White-tailed Tropicbird feeds on sea animals including fish and squid which are caught by surface plunging. The call is characterized by high screaming resembling a bosun’s whistle. Some of the Cayman Island’s bird’s species have been listed as Endangered including the Black-capped Petrel. Threats facing the birds on the island include; habitat loss due to human activities such as deforestation which reduces the amount of available nesting habitat. The introduction of predators into the habitat such as large fish species, snakes, and turtle, direct harvesting by human being, and migration of birds to the nearby islands are also some of the major threats. The conservation plans for the birds on the Cayman Islands include preserving the forest cover around the birds’ nesting areas.